The National Basketball Association (NBA) is one of the most popular and well-established men's professional basketball leagues in the world. NBA players are considered not only to be the most proficient players but also among the world’s best paid sportsmen. The intense competition among players and teams in the league lends importance to the use of sports statistics in interpreting individuals’ and teams’ levels of success. The main objective of this study was to classify the performances of teams in the NBA using linear discriminant analysis and logistic regression analysis. We propose a statistical model that identifies the variables having the most significant effects in determining the possible. NBA teams; Playoff; Discriminant Analysis; Logistic Regression Analysis. Albert, A., Lesaffre, E. (1986). Multiple Group Logistic Discrimination, Computational Mathematics with Applications, 12 A, 2: 209-224. Aldrich, H. J., Nelson, D. F. (1984). Linear Probability, Logit and Probit Models, Series: Quantitative Applications in the Social Sciences, No:45, USA: Sage University Paper. Berri, D. J., Schmidt, M. B. (2002). Instrumental vs. bounded rationality: The case of Major League Baseball and the National Basketball Association, Journal of Socio-Economics, 31(3): 191- 214. Carlin, B.P. (1996). Improved NCAA basketball tournament modelling via point spread and team strength information, The Amer Statistician, 50, 39-43. Fisek, K. (1998). Devlet Politikası ve Toplumsal Yapıyla Iliskileri Acısından Dunya’da ve Turkiye’de Spor Yonetimi, BagirganYayınevi, Ankara. Gomez, M.A., Pollard, R. (2011). Reduced home advantage for basketball teams from capital cities in Europe, European Journal of Sport Science, 11(2): 143-148. Hair, J., Rolph, E., Ronald, L. and William, C. (1995). Multivariate Data Analysis with Readings, New York: Prentice Hall International Editions. Ibanez, S., Sampaio, J., Feu, S., Lorenzo, A., Gomez, M. and Ortega, E. (2008). Basketball game- related statistics that discriminate between teams season-long success, European Journal of Sport Science, 8: 369–372. Johnson, R. A., Wichern, D.W. (2002). Applied Multivariate Statisticial Analysis, New Jersey Pearson Education Int. Klecka, W. (1980). Discriminant Analysis, London: Sage Publications. Lachenbruch, P.A. (1975). Discriminant Analysis, London: Hafner Press. Lemeshow, S., Hosmer, D. (2000). Applied Logistic Regression, Wiley Series in Probability and Statistic, 2. Edition, New York: Wiley Interscience. Lorenzo, A., Gomez, M., Ortega, E., Ibanez, S. and Sampaio, J. (2010). Game Related Statistics Which Discriminate Between Winning and Losing Under-16 Male Basketball Games, Journal of Sports Science and Medicine, 9: 664-668. Mass, C. M. (2002). Webster's Third New International Dictionary, Unabridged, Merriam Webster, http://unabridged.merriam-webster.com, Retrieved 15 October 2012. NBA (2012). http://www.nba.com, Retrieved 12 September 2012. Sampaio, J., Janeira, M., Ibanez, S. and Lorenzo, A. (2006). Discriminant analysis of game-related statistics between basketball guards, forwards and centres in three professional leagues, European Journal of Sport Science, 6: 173–178. Schwertman, N.C., Schenk, L. and Holbrook, B.C. (1996). More probability models for the NCAA regional baketball tournaments, The Amer Statistician, 50, 34-38. Smith, N., Handford, C. and Priestly, N., (1996). Sport Analysis in Coaching. Department of Exercise and Sport Science, Crewe and Algeser Faculty, The Manchester Metropolitan University, Manchester. Tavares, F., Gomes, N. (2003). The offensive process in basketball - a study in high performance junior teams, International Journal of Performance Analysis in Sport, 3(1): 34-39. Trninic, S., Milanovic, D. and Dizdar, D. (1997). Where are the differences between winning and losing teams in basketball?, School of Sport , 38: 25-35. (In Italian). Trninic, S., Dizdar, D. and Dezman, B. (2000). Empirical verification of the weighted system of criteria for the elite basketball players quality evaluation, Collegium Antropologicum, 24: 443- 465. ISNAD Ergül, Barış . "CLASSIFICATION OF NBA LEAGUE TEAMS USING DISCRIMINANT AND LOGISTIC REGRESSION ANALYSES". 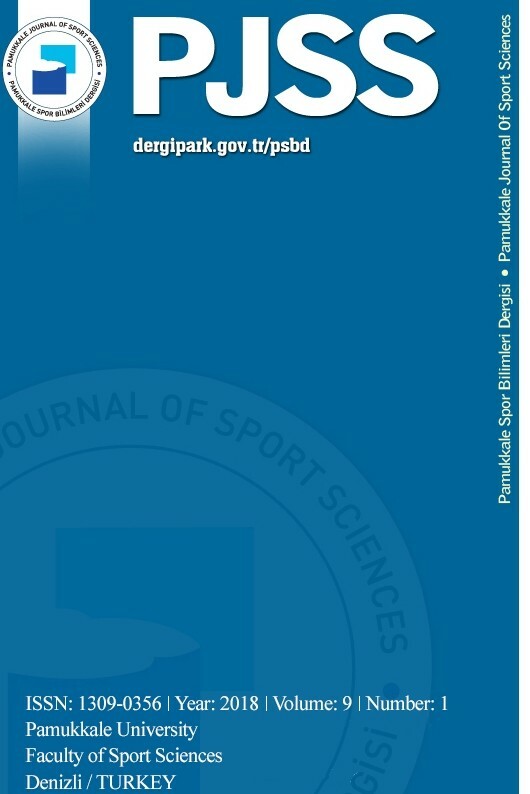 Pamukkale Journal of Sport Sciences 5 / 1 (January 2014): 48-60.